I signed up to be a guest blogger for the fabulous Boutique Larrieux’s blog. This month’s post is dedicated to shorts. I know so many curvy girls who are afraid to wear shorts and stick to capri’s or bermudas out of fear of showing their legs. 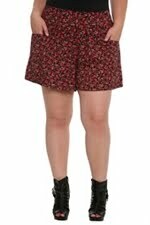 The post offers you a few options besides bermudas to help you find the right pair of shorts for your curvy body. My favorite pair this summer is culottes. I thought I would never hear that word again since the 90’s. I’m ordering a pair from Torrid. Check out my post on Boutique Larrieux’s blog corner here.